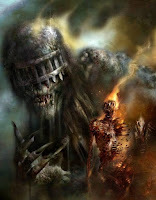 Writer John Wagner (Judge Dredd, A History of Violence) and Nick Percival (Clive Barker's Hellraiser) are to follow up 2015’s chilling Dark Justice with a new story featuring the infamous Dark Judges. An Alien-style race-against-time Dark Justice saw undead alien superfiends Judges Death, Fear, Fire, and Mortis run amok on an ark ship full of colonists. Judge Dredd and Judge Anderson raced against time to prevent the mass murdering zombies from claiming the last survivors and at its conclusion Fear had been captured but Death, Fire, and Mortis were left floating in deep space. The new series will begin Judge Dredd Megazine #386, published in print and digital by 2000 AD on 19 July 2017. Originally created by John Wagner, Alan Grant and Brian Bolland in 1981, the Dark Judges are undead and unkillable Judges from another dimension where all life has been declared a crime. After being left fallow for years, they have enjoyed a something of a renaissance after Fire, Fear, and Mortis were freed during the epic Day of Chaos storyline. Not only did they appear in the Dark Justice story, released as a hardcover in 2015, but writer Kek-W and artist Dave Kendall have explored their origins in new, inventive, and horrifying ways in Dreams of Deadworld and Fall of Deadworld, stories which will be collected later this year.